Here’s my 5th review for the great Genre chosen by Tom for this month’s Genre Grandeur – Space. Brief Synopsis – Based on the true story of the only US accident in space when three astronauts got stranded on their way to the moon when their spacecraft is damaged. My Take on it – This movie by Ron Howard was definitely a spectacle to watch on the big screen. 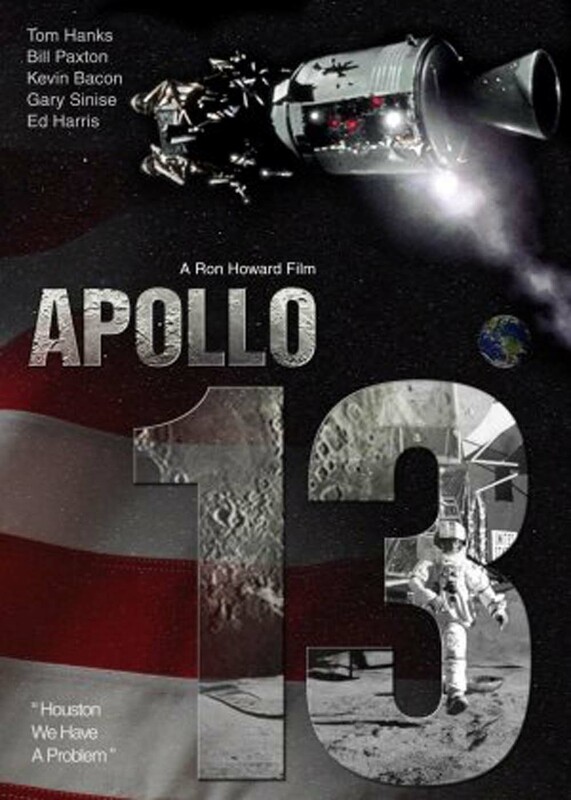 I had known the basics of the aborted Apollo 13 mission beforehand, but this movie gives such an elaborately detailed account of the story that it brought the story up to a level where just about everyone is now familiar with the mishap in space. This movie has a great ensemble cast led by Tom Hanks and Ed Harris. It also features Gary Sinese, Kevin Bacon, Kathleen Quinlan, Bill Paxton in important roles. The situation that these men were in was a desperate one and this movie manages to shows how they and those on the ground dealt with it in both an inspirational and a patriotic fashion. Even 19 years later I’m still shocked that the American Patriotism that seeps from every inch of this film wasn’t able to propel it past Braveheart (1995) for the Best Picture Winner that year at the Oscars. Bottom Line – Great inspirational and patriotic movie that gives the viewer feelings of hope and faith amidst despair and uncertainty. Amazing cast led by Tom Hanks and Ed Harris! Was one of the biggest surprise loses in Oscar history. Highly recommended! This is going to sound ridiculous, but this movie combines two of my greatest fears: being enclosed in a small container and dying in outer space. (Fortunately, there’s no chance of my becoming an astronaut so I feel pretty confident about the second scenario.) Because of that, this movie is a tricky one to watch…but it is so well done, a claustrophobic outer-space-fearing person can’t NOT watch it. The acting and script are spot-on. In fact, I think it’s time to see it again! But wasn’t Apollo 13 made for televsion? Wonderful Rob. Nice to see you point out the patriotism that bled through the celluloid here; I have never really stopped to think about that aspect but you’re 100% right. Ron Howard managed to effect a great American pride in this story amidst the terrible disaster. This is one of my favorites of all time. No doubt about it. I love Apollo 13 and agree that it deserved to do better than Braveheart, although Braveheart is one of my movie hates (possibly to an irrational degree!). Braveheart has it’s merits, It’s pretty good, but Apollo 13 shouldn’t have won just because it’s better and for it’s patriotism. I wonder if it would’ve been made after 9/11 it would have been given more support. Thanks for stopping by and commenting David!